I liked Trepadora, actually. It seemed so simple when it first appeared. At first, I wasn't sure if Luppi had really shown his true release because he hadn't changed from appearance all so much. 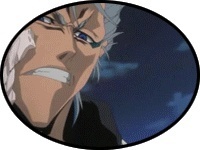 But the abilities to strike out with eight different tendrils at once makes Luppi great for fighting multiple enemies. Even Senbonzakura would have trouble against that. Byakuya could draw back the blade-petals to defend but coming from eight different sides he'd likely be on the defensive most of the time and neigh manage to attack. He'd have to rely on Kageyoshi rather quickly. Komamura seems like he'd just get owned. A giant isn't going to do much against the fast-moving strikes of those eight tendrils. To beat that, it'd take more intellegence than brute strength (IE: Hitsugaya's win). The only exception, as I said, would be Ichigo's uber speed. And that's assuming his sword would even manage to cut Luppi's Trepadora. He'd have to rely on good-ol' hollow state I believe.